To Cite: Karajibani M, Merkazee A, Montazerifar F. Determination of Aflatoxin in the Imported Rice in Zahedan, South-East of Iran, 2011, Health Scope. 2013 ; 2(3):125-129. doi: 10.17795/jhealthscope-10736. Background: Rice is common foodstuffs in Iran. Aflatoxin contamination of rice can be hazardous human health and causes economic problems. Objectives: Determination of Aflatoxin levels was investigated on the imported rice which is consumed as the main food in this area. Materials and Methods: Two hundred samples of imported rice consisting; yellow (100) and white (100) rice were selected randomly. These samples were assessed for Aspergillus infection and the Aflatoxins B, G was detected by high performance liquid chromatography (HPLC) method. Results: The results showed, 33% and 47% of yellow and white rice samples had contaminated 0.34 and 0.58 part per billion (ppb) with Aflatoxin B1 respectively. It was observed 13% and 21% following samples had also contaminated 0.06 and 0.08 ppb Aflatoxin B2 respectively. The levels of G1 and G2 Aflatoxins were impossible to identify in these samples. Conclusions: According to proposed standards, none of the imported rice sample had not contaminated more than the maximum allowable concentrations of Aflatoxin. Rice (oryza sativa) is one of the most widely consumed crops imported to Zahedan through South East customs. It is one of the least susceptible foods to mycotoxins contamination while it can affected during the pre- or post harvest stage (1). Aflatoxins (AFT s) are the secondary metabolites mainly produced by Aspergillus flavus (2, 3). This toxic substance, with four out of 20 different types which are known; including B1, B2, G1, and G2 could lead to some health problems (4). Among all the mycotoxins, Aflatoxin B1, B2, G1 and G2 could lead to some health problems such as acute and chronic poisoning among animals and human beings; hepatotoxic, cirrhosis and some malignancies as well as immunodeficiency causing recurrent infections (3, 5), Faraji et al. have reported that all samples of rice (60 specimens) contained AFT which AFT B1 and AFT B2 levels were found to be 2.55 and 0.34 µg/kg, respectively. Besides, in 8.3% of the samples the amount of AFT B1 was more than maximum allowed concentration in foodstuffs of Iran (6). In another study, among 152 samples of imported rice in Bushehr, southern part of Iran, 57% of those were contaminated with AFT B1. There was no sample with AFT B1 more than the maximum tolerated level (MTL) of 5 ng/g assigned by standard of Iran. Totally, 76 - 97% of samples were contaminated with AFT. The amount of AFT Contamination of imported rice was dissimilar in different months (7). Frequent and heavy rainfalls and floods especially near the harvest time in different regions of India, had moisturized the crop and make the panicles more likely to invasion of Aspergillus flavus (8). Several reports have been published about the Aspergillius and AFT B1 contamination and the related economic damages in China (9, 10) and India (11). AFT were first discovered in Europe in animal foods. The four major AFT that contaminate the crops are B1, B2, G1, and G2. A.flavus produces AFT B1 and B2 while A.Parasiticus produces all four AFTs; AFT B1 is the most toxic and best type of AFTs (7). Liu et al. have investigated AFT contamination in 110 samples of maize and rice grains in Liaoning province in China. The mean concentration of AFT in maize, whole grain rice and brown rice were found to be 0.99, 3.87 and 0.88 µg / kg, respectively and no significant differences were detected, AFT contamination is reported more in whole grain rice and brown rice over a 10-year storage period (10). In the study of Siruguri et al. no exceeded of AFT contamination was reported based on the criteria of the food safety and standards in stored rice collected from Panjab, India. The results indicated the stored paddy of PAU-201 rice variety were in agreement with the food safety and standard regulations (12). Because of the toxic and potent carcinogenic properties of Aflatoxins, many developed countries have established very strict regulations limiting the maximum allowable concentration of Aflatoxins in food and feed (10). Therefore, many of committee and institutes have determined standards for the acceptable amount of the mycotoxin in foods because of its harmful effects. For example, a European committee (Codex) has defined an acceptable maximum level of 4 parts per billion (ppb) in rice. This acceptable level of AFT B1 is 5 - 10 ppb in feedstuffs and 4 ppb in foodstuffs. The permitted amount which has already been determined in Iran is 30 ppb for all AFT and 5 ppb for AFT B1 in rice respectively (3). Several developing countries such as China, and Mexico have established compatible regulations with those in the United States for human consumption and trading (10). Regulatory authorities in some countries have set tolerate limits for AFT s that range from 0 to 50 µg/kg to control its levels in the food supplies. For example in India, a tolerate limit of 30 µg/kg has been prescribed under the food safety and standards for all foods meant for human consumption (12). Pakistan, Bangladesh and Thailand are the largest producers of rice in the world. Especially, Pakistan is located in the neighbor of Iran. This country similar to others, have frequent and heavy rainfalls and floods that provide a proper condition for the development of fungi such as Aspergillus (8). Rice in normal condition is not considered as a conductive product of Aspergillius growth and AFT contamination, but when exposed to heavy rains or high moisture could become prone to AFT contamination (12). Since, the amount of Iranian rice is not enough for domestic consumptions of this region, The rice imported to Iran. The imported rice is usually examined for AFT contamination by the Institute of Standards and Industrial Research of Iran ( ISIRI) and the minimum level of contamination of AFT B1 (5 ng/g) and the total AFT s (30 ng/g) is considered as the allowable concentration (7). Zahedan is the major city of importing rice in south-east of Iran, yet there has been no survey on the AFT levels of the imported rice in this area. Therefore, it is critically important to investigate the rate of AFT contamination of imported rice. Especially, it has high consumption based on nutritional and world rice trade. This study was carried out to determine the AFT levels in imported rice in Zahedan (south-east) of Iran. This study was performed on a total number of 200 samples of imported rice (4 kg each) in four seasons. Those were randomly selected from warehouses of Zahedan custom. According to previous similar studies Farajih et al. (6), Mohammadi et al. (7), Liu et al. (10), and Siruguri et al. (12), 200 samples of paddy rice was selected. Twenty five yellow rice and 25 white rice samples were collected in each season. Rice samples were stored in zip-locked plastic bag at 4ºC until the AFT analysis. This study conducted from 1- March 2010 to 1- February 2011. All tests were conducted in mycology laboratory of Zahedan University of Medical Sciences and Health Services and Scientific Research Laboratory of Tis Khatam Training, Research & QC. Lab Services in Zahedan, Iran. Test portion is extracted using methanol and hexane. Extract filtered, diluted with water to specified solvent concentration, and applied to an affinity column containing antibodies specific to AFT B1, B2, G1, and G2. AFT s are removed from the affinity with methanol and quantified by reversed- phase liquid chromatography (LC) with post-column derivatization (PCD). PCD is achieved with either electrochemically generated bromine and determined by fluorescence detection (13). All the samples were grounded with miller and collected in plastic bags. Then, 50g of the grounded samples was used for analysis by high performance liquid chromatography (HPLC) method (14, 15). Briefly, 5g sodium chloride was added to each 50 g of samples. Then it was mixed with ethanol. After filtering through glass microfiber filter (GFF) filter paper, the extract was diluted by deionization water. Aflatest immunity columns (IACs) were used to clean up the samples. At first phosphate buffer saline through the IACs. The column was washed by water and dried by applying little vacuum. AFT was eluted by methanol. The eluate was diluted by dionized water and filtered, and injected to HPLC (13). For determination of AFT , HPLC (Agilent Technologies) and immune-affinity columns (IACs) (HPLC 1200 FLD Agilent-g 1321 a DE605572295) were used. Affinity column contained anti AFT B1, B2, G1, and G2 antibodies. A calibration curve was drawn for different type of AFT including AFT B1, B2, G1, and G2 (13, 16). The effectiveness of the extraction procedure was confirmed by adding pure AFT B1 to the grounded rice and extracted using 70% methanol-KCl. Recoveries of AFT B1, B2, G1, and G2 from rice samples were 88.9%, 87.6%, 87.5%, and 83.0% respectively. Therefore, the concentrations of AFT were correctly measured. In order to confirm the accuracy of the test, the sample extraction of HPLC procedures were repeated and the types of toxins, as well as their content, were double-checked. Statistical analysis was performed using SPSS 11.5 software. Results were given as mean ± SD. Student t-test was assessed for comparison of the mean values of AFT, AFT B1 and AFT B2 in the samples (white and yellow rice) in different seasons. A value of P < 0.05 was considered statistically significant. The majority of AFT B1 contamination in white and yellow rice samples were 47% (0.58 ± 0.47 ppb) and 21% (0.34 ± 0.25 ppb), respectively (P = 0.02). The AFT B1 and B2 concentrations of rice samples have shown in Table 1. Minimum and maximum AFT B1 contamination of white rice samples were 0.07 ppb in winter and 2.36 ppb in summer, respectively. As well as, minimum and maximum AFT B2 contamination of white rice samples were 0.01 and 0.26 ppb in winter and summer, respectively. It was observed that most of the AFT B1 contaminated white rice was 0.87 ± 0.66 ppb (0.08 – 2.36) in summer, compared to the lowest amount of AFT B1 contaminated white rice which was was 0.40 ± 0.42 ppb (0.40 – 0.43) in autumn (P = 0.01). Totally, minimum and maximum of total AFT in white rice were 0.01 and 2.36 ppb in winter and summer respectively. AFT G1 and G2 were not detected in the samples (Table 1). The mean contamination of yellow rice samples with AFT B1 and B2 were 33% (0.34 ± 0.25 ppb) and 13% (0.02 ± 0.04 ppb), respectively (P = 0.01). Minimum and maximum AFT B2 contamination of yellow rice samples were 0.002 ± 0.004 ppb (0.00 - 0.01) and 0.05 ± 0.04 ppb (0.00 - 0.11) in winter and summer respectively. In general, the mean concentration of total AFT in white rice was 1.7 fold more than that in yellow rice. The mean AFT B1 level in imported rice is shown in Figure 1. 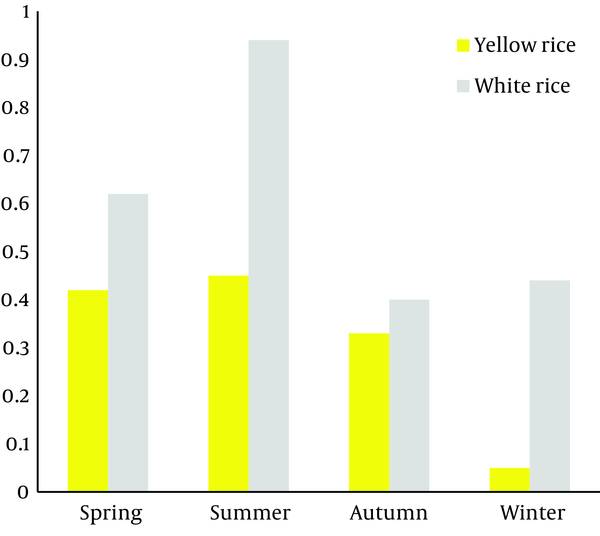 As shown the maximum amount of AFT B1 in white and yellow rice samples was detected in summer. But, the minimum level of AFT B1 in both samples was detected in autumn and winter respectively. The majority of imported rice samples to Zahedan was white rice. But, the consumption of yellow rice has special position among the people of this region. The result showed 47% and 33% of white rice and yellow rice samples had been contaminated with AFT B1 respectively, which is the most toxic form and a risk factor for human health. AFT contamination could be a serious problem, even at low levels (17). Damaged food grains resulting from fungi invasion and subsequent spoilage may produce mycotoxins that are known to be toxic to human and animals (10). Reedy et al. reported all the paddy rice had AFT B1 contamination and also milled rice grains from different states of India had below the permissible levels of AFT B1 (average 0.5 - 3.5 µg/kg) (18) Invasion by fungi before harvest is primarily governed by planet host-fungus and other biological interactions such as insects, while growth by fungi postharvest is governed by nutrients, temperature, moisture and biotic factors (insects) factors. Nevertheless, the original source of the fungi in both circumstances is the field (19). Different factors such as, the crop type, temperature affecting the AFT production (20). Studies on the percentage of spore germination, growth rate and Aflatoxin B1 production were carried out in vitro in relation to water activity (aw) at 0.982, 0.937, 0.809 and 0.747 values and stops at 0.809 and 0.747aw (21). It was observed, AFT contamination and A. flavus infections are often associated with drought and temperature (10). It was found that aflatoxigenic fungi and AFT formation might be inhibited by some synthetic or natural protectants during storage (10). However, market rice represents an important source of exposure to AFT (8). Rice under regular status is not considered for growth of Aspergillius and AFT contamination. But when exposed to heavy rains or high humidity could be predispose to AFT contamination (6, 12). The summer heat and high humidity can lead to mold growth and AFT production (6). For these reasons, it seems the level of AFT B1 in white and yellow rice samples in summer was more than the level of AFT B1 in both samples in autumn and winter. Several studies have been carried out to determine the amount of AFT contamination in imported rice to Iran during March 2006-March 2007 which were analyzed for AFT B1, B2, G1, and G2 contaminations using immunoaffinity column and quantitated by HPLC. The mean of AFT was 2.09 ng/g for all samples. AFT B1 level in 2.8% was above the maximum tolerated level (MTL) of AFT B1 in Iran (5 ng/g). The mean contamination level (2.09 ng/g) was lower than the maximum tolerated level (MTL). The MTL of AFT in rice in Iran was also lower than maximum level of AFT in European standards (EU) for maximum tolerated levels (MTL) of AFT (4 ng/g), and only nine samples had levels more than the maximum tolerated level (MTL) of EU in AFT (22). The results showed AFT contamination of maize and brown rice in Liaoning province in China was lower than other region in Asia and the regulated safe consumption level established by most countries (10). AFT B1 compromised the highest amount of contamination in our study, and the AFT G1 and AFT G2 have not been detected in samples. The results showed, the incidence of contamination in white rice was more than yellow rice. On the other hand, the most and least of AFT contamination in the rice samples was observed in summer and winter respectively. The temperature of summer is more than winter which is one of the factors to predispose the growth of microorganisms such as fungi. Besides, because of parboiling process which including; heating, soaking, steaming and drying cause the starch in rice convert to gelatin and improve nutritional properties (23). The rice grain might contain or have produced certain enzymes or chemicals that inhibited the production of AFT or a type of AFT B1 (10). Moreover, fumigation process is usually used for imported products, which probably decreases the rate of AFT contamination. There are many methods which detoxificate AFT in foods including; chemical manufacture, such as citric, sodium hypochlorite (24) and ozone (25). In conclusion, according to the standard of Iran, the allowed amount of AFT in rice which has already been defined, is 30 ppb for AFT and 5 ppb for AFT B1 (11). None of the imported rice had AFT contamination more than standard levels and AFT B1 levels were below the internationally acceptable limits for human consumptions. The results showed the amount of AFT s was reduced in imported rice. This might help to partly explain our observation in this study, although we did not have detailed information about the pesticide application to the rice that was sampled. Nevertheless, it was reported, there is an increasing tendency of AFT s levels with the length of storage (10). For example, biological sanitization of mycotoxins using microbes is one of the different strategies for the management of these deadly fungal toxins in food and feed. But, determination of small quantities of AFT in all sorts of rice is emphasized in most investigations. The public health efforts to stop AFT exposure during an aflatoxicosis must include randomize sampling from rice, assessment of AFT contamination and application of strict laws on permissible limits of AFT levels in food and feed products. The authors would like to thank the laboratory staffs and other colleagues who have contributed to this research. Implication for health policy/practice/research/medical education: Rice is one of the most widely consumed crops imported to Zahedan through the South East customs. It is one of the least susceptible foods to mycotoxins. Aflatoxins (AFT) are the secondary metabolites produced mainly by Aspergillus flavus. Aflatoxin B1 is the most toxic form for human with complications including; hepatotoxic, teratogenic and mutagenic properties, hemorrhage, immunosuppressant and hepatic carcinoma. There has been no survey on AFT levels in the imported rice to this area. It has a high consumption based on nutritional and world rice trade. Therefore, this study carried out to determine aflatoxin levels of imported rice to Zahedan, south-east of Iran. Authors’ Contribution: Dr Mansour Karajibani designed the study, reviewed and revised the manuscript and approved the final manuscript as submitted. Mrs Azita Merkazee coordinated and conducted the laboratory tests and supervised data collection. Dr Farzaneh Montazerifar carried out the initial manuscript.